Revolve, the digital retailer founded in 2003, recently filed to go public. Revolve still seems relevant today, even though the company has been around for 15 years. The retailer’s S-1 filing reveals a large amount of information about the company, the business of being a retailer, and the retail landscape more generally. Below is a breakdown of the most interesting parts. Right off the bat, Revolve positions itself as the anti-Amazon: an evolving lifestyle brand built for millennials with a website created for both discovery and inspiration—a far cry from Amazon’s hyper-transactional interface and mentality. Revolve currently stocks more than 500 total brands (although it says it stocked a total of 1,200 in 2017, which would equate to a massive downsizing of its brand roster) and generated $399.6 million in sales the same year. 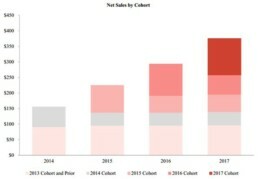 It also served more than 840,000 active customers with more than 110,000 unique styles, leading Revolve to claim it is “one of the largest standalone fashion eCommerce businesses in the United States.” Interestingly, no third-party brand accounted for more than 2% sales in 2017, while Lovers + Friends, one of Revolve’s private labels, was the top selling brand and accounted for 5% of 2017 Revolve sales. This contrasts with Farfetch, where 22% of its gross merchandise value (GMV) comes from its top ten retailers. The crux of Revolve’s positioning is that “next-generation consumers are currently underserved by traditional brick-and-mortar and online retailers.” Department stores have too broad a focus, it argues, and therefore are slow to react to changing trends. Conversely, speciality boutiques are strong in curation, but lack the necessary reach to have an impact. Both of these options fall through on discovery and inspiration, Revolve says—it aims to fill this void. Though Revolve looks a lot like a fast-fashion retailer—it adds over 1,000 new styles to its offering each week and relies heavily on data-driven merchandising—the company never once mentions fast fashion in its filing, a seemingly important competitor. This is the first of a few nuanced emissions, since Revolve’s millennial consumers are also buying fast fashion. The second omission is that while Revolve says the average age of a department store customer is 42, it does not disclose its own average customer age. At the same time, it says that it has only reached 2% of it’s core demographic of 18- to 44-year-old women in the United States. This is meant to speak to the large opportunity ahead—Revolve’s ability to connect with young customers who don’t share strong bonds with traditional retailers—but it also raises questions about how young its customers actually are if they aren’t willing to disclose the number. Eighty-three percent of Revolve’s sales come from the company’s eponymous site—mostly focused on ready-to-wear and contemporary apparel, beauty and accessories. Here, the average order value (AOV) was $270. The other 17% of sales come from FORWARD, it’s luxury vertical, where the AOV was $717, a stark increase. Meanwhile, almost 19% of Revolve’s total sales came outside of the U.S. This percentage has barely changed in the last few years, although the company plans to invest more in Europe, Canada and Australia and Asia. But at the same time, 40% of its Instagram and Facebook following is outside the U.S., which is either a testament to its international potential or an omission of its low social penetration domestically. Revolve sells products from emerging brands (52% of 2017 revenue), established brands (23%), and owned brands (20%), showcasing a distributed merchandise mix—and one that is quite focused on new-age brands. As Revolve looks to the future, it aims to expand in a number of ways: scaling FORWARD, its luxury business; increasing its beauty assortment, one of its fastest-growing verticals; offering lower price point items, ideally to attract younger shoppers; and further expanding its men’s assortment for millennials, a customer bracket that Revolve believes is underserved. While these are all logical avenues to grow the business, it calls into question how long Revolve can fill the gap between broad department store assortments and specialized boutiques before it becomes the thing it is fighting against. All of these growth areas carry the risk of diluting the ethos and tightness of the company’s assortment, as do continued additions of 1,000-plus products per week. These are all tradeoffs and it won’t be possible for Revolve to fulfill all of its plans while maintaining its philosophy. Eventually the small guy becomes a bigger guy and the value prop from the beginning holds less weight. Revolve has to be careful about how it goes about expanding its assortment and customer base. We have built a custom, proprietary technology platform to manage nearly all aspects of our business, with a particular focus on developing sophisticated and highly automated inventory management, pricing, and trend-forecasting algorithms. Our proprietary technology leverages data from a vast net of hundreds of thousands of styles, up to 60 attributes per style, and millions of customer interactions, creating a strategic asset of hundreds of millions of data points. Everything above sounds a lot like Stitch Fix’s data capabilities and potential benefits, but without the subscription box foundation. One of the benefits of this technology, Revolve argues, is that 75% of its sales are at full price or nearly full price, which is definitely a good thing and comes from tight merchandising and inventory control. But hidden in the depths of the S-1 is the disclosure about the retailer’s return rate: In 2016, it was 48%; in 2017, it was 49%; and in the first half of 2018, it has increased to 52%. In 2017, for example, the retailer actually had gross sales of under $800 million, but only booked just under $400 million in net sales after returns. This is quite high for a retailer on the internet—most brands range between 15-30% depending on the product—and while some can argue that returns are good because it means people are trying products and coming back multiple times, there is no denying it’s an expensive habit to entertain, to the tune of over $60 million in shipping and fulfillment costs in 2017, or 15% of net sales. Since Revolve had a 48% gross margin in the same year, shipping instantly knocked its margin down to 33%. The velocity of returns calls into question the true effectiveness of this “proprietary technology” for a general retail business; this technology should minimize the need for returns by providing desirable styles and better fit to Revolve’s customers. However, this technology is important and can pay more dividends with Revolve’s growing assortment of private-label brands. The company’s 19 private labels now comprise eight of its top ten brands—private-label sales have also doubled since 2016, amounting to 27% of Revolve’s total sales. These brands generate higher margins than the third-party brands sold on Revolve—the company actually resists calling them private labels because it argues it can actually charge a price premium on these items rather than a discount, like most private-label brands do. Like many other retailers trying to figure out their worth in a world of endless assortments, Revolve is increasingly focused on products customers can only find on its site. Its technology can allow Revolve to understand and produce on-trend product quickly and in limited quantities—something Amazon is also increasingly turning to with its 120 and growing private-label brands. In 2014, Revolve acquired Alliance Apparel Group to power its owned brands. Alliance’s network enables Revolve to work with 132 suppliers and manufacturers in China, India and the United States, where no single supplier is responsible for more than 6% of purchased goods. Its diversified supply chain is important, particularly in the political and tariff environment we are currently experiencing. The most interesting part of the private labels, however, is how Revolve uses them in its marketing funnel. Since these brands carry higher margins than products it buys from third parties, the company has more margin at its disposal to plow into customer acquisition—specifically getting a shopper to make her first order. This allows Revolve to position its private labels as a beachhead—an entry point for new shoppers. In 2017, private labels made up three of the top five brand search terms on external search engines that led to a purchase, showing its initial effectiveness. After a customer buys something from Revolve and one of its owned brands, she will then likely buy more from the wider assortment—but regardless, the customer is already profitable after her first order, according to Revolve, increasing the contribution margin. In a world where digital marketing costs are increasingly exponential, this is a very smart strategy. As per Revolve’s brand marketing efforts, it believes these owned brands will be a major growth and cash flow driver to power future investment in the business. But even so, the filing hints at an increase in digital marketing costs, which could pose a longer-term threat, even with increased margins to afford the rising costs. Revolve has a good CAC/LTV ratio because of its private labels, clocking in at 4.7x over three years. This means every dollar it spends acquiring a customer is worth $4.70 in sales over that time period. The retailer’s CAC has held steady from 2014 to 2016 at $30, even as it increased marketing—it spent $7.3 million in marketing to acquire 242,450 new customers. While the number jumped to $38 in 2017—the company said it tried to focus on more full-price (i.e. expensive) customers—the 2014 cohort delivered a profit of $43 on its first order (calculated after marketing expenses), still ensure profitability. This is where AOV and private labels become crucial: AOV is $270 for Revolve proper, giving the company plenty of room to cover marketing, fulfillment, and other operating expenses. One would hope the math is even better for FORWARD, with an AOV of $717, even with higher acquisition costs that should not be proportional. Another important retention metric is repeat return rate, which the company breaks into two different metrics. One is called Existing Customers—shoppers who placed an order in the prior year and the current year. This percentage was 33% in 2014, but has grown to 41% in 2017—a material increase. The second is called Repeat Customers, which the company defines as shoppers who have purchased at least once before, regardless of year—49% in 2014 and 57% in 2017—which is also a positive improvement. Existing Customers are more profitable than Repeat Customers, and they made up 66% of order volume and 69% of total sales in 2017. This past year, 88% of sales came from customers who shopped the previous year. At the same time, return traffic is high, with 55% of net sales coming from customers that visited Revolve’s site at least twice each week. So far, retention is looking relatively strong. While Revolve has an image as an influencer- and brand-heavy marketer, it claims that 75% of its advertising costs actually go to “performance marketing efforts”—paid ads, email marketing, and mobile push notifications—as opposed to fluffier and less traceable marketing. This could be important in a world where influencer marketing costs are rising and have questionable conversion rates. While the company spends only 25% of its marketing budget on brand marketing, it often feels to outsiders like that percentage is actually 75% with all of the parties and events that light up Instagram. In effect, this perception is a testament to the quality of Revolve’s work. Ask someone about Revolve and he or she will mention the word “influencer.” Revolve treats influencers like most CPG brands treat TV. It has 2,500 influencers and brand partners, and more than 5 million Instagram followers as of June 30, 2018, across Revolve, FORWARD and its private-label brands. It also points to social media-friendly events (it hosted 125 in the year ending in June 2018) such as the #RevolveFestival at Coachella, which more than 400 of the company’s influencers attended. At this event, the company received approximately $1.5 million in sponsorship dollars and gained over 150,000 Instagram followers, acquiring each follower for $10. “We pair this emotional brand marketing with sophisticated, data-driven performance marketing to further drive profitable customer acquisition, retention and lifetime value,” the company stated in its filing. But the 75% of the marketing budget spent on performance marketing, which helps Revolve close sales, is really what makes all the difference. Brand marketing needs to be converted into sales with performance marketing, and this is where Revolve is well-poised at both the top and the bottom of its marketing funnel. Even so, it will be important to watch rising costs in this area, which could harm this marketing strategy’s long-term effectiveness. All of this work is even more impressive given that Revolve has only raised $15 million to date from a single outside investor, TSG Consumer Partners. This is a drastically minimal amount of venture capital compared to Yoox Net-a-Porter, which has raised $118.7 million since its 2000 founding and Farfetch, which has raised $701.5 million since its 2008 founding. Farfetch has $386 million in revenue in 2017—less than Revolve—but it raised almost 47x more money. Revolve has been profitable 14 out of its 15 years of existence, which is impressive, and it plans to use its cash flow to continue funding the business. While Revolve positions itself as the anti-Amazon, a lot of the engine under the hood looks and feels like the largest ecommerce platform. Like Amazon, Revolve relies heavily on data-driven operations to power its merchandising decisions, and, crucially, the development of its own private labels. Both companies understand the power of free cash flow and use it to minimize dilution and grow their businesses. Where they diverge is in the look and feel of their websites, where Revolve takes the lead and Amazon falls behind, not to mention the former’s ability to attract a young, coveted audience. But as Amazon continues to find its footing in the fashion and contemporary apparel space, Revolve might have exactly what it needs and importantly share an ethos that would allow both cultures to co-exist and learn from one another. Maybe it’s time for Bezos to attend #RevolveFestival at Coachella and slide into Revolve’s DMs.